Partly cloudy skies. Low 48F. Winds WNW at 5 to 10 mph. A potential new housing development, Sage Ranch, is being discussed with the city of Tehachapi. Developers of Sage Ranch, a proposed housing development in Tehachapi that would include apartments, town homes and single-family residences, are entering into an agreement with the city to produce an environmental impact report for the land. “City staff is now required under the zoning code to process that application, which includes notably the preparation of the California Environmental Quality Act Environmental Impact Report that’s a sizable document, that is likely to cost over $100,000. Obviously, the city does not want the taxpayer to pay for the expense associated for the preparation of that document, so we have prepared for you a reimbursement agreement,” said Jay Schlosser, development services director for the city, at the March 18 City Council meeting. The city of Tehachapi Planning Commission approved the general land uses for the project on 138 acres south of Valley Boulevard and west of Tehachapi High School at its Feb. 11 meeting. The EIR document is not complete until the City Council finalizes and approves it and a notice has been posted for 35 days, according to City Council documents. 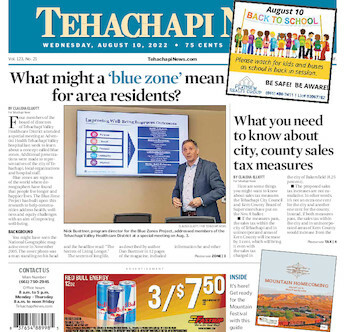 Residents in the city of Tehachapi can make use of the document and be informed of the environmental impacts of the project, ways to minimize effects, and alternatives to the project, according to resources.ca.gov. “It is purely an approval to get reimbursed from Greenbriar Capital for the environmental impact report,” said City Manager Greg Garrett. Greenbriar Capital is the developer for the project. Councilman Kenneth R. Hetge asked if AECOM Technical Services, an engineering consultant the city uses, will be involved in the process. Hetge added that Schlosser was an employee of the firm in the past and was concerned about a conflict of interest. Garrett responded that AECOM would not be used in the EIR, but could provide services if a structure was built on the housing division, if city staff were unable to provide services for the project. The City Council voted 4-0 with one abstention from Hetge.